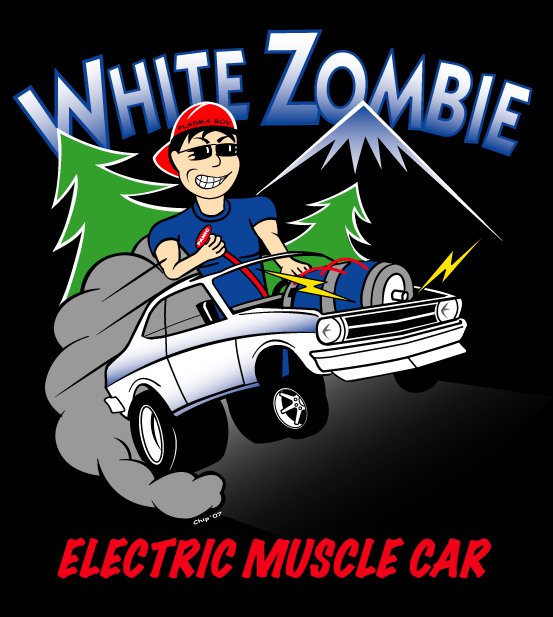 Description : Chip Gribben has done it again with his over-the-top electric hotrod cartoon talent, this time capturing the spirit of Plasma Boy and his trusty steed White Zombie in this in-your-face fun T-shirt design. Note Oregon's Mt. Hood in the background and the Douglas Fir trees bending against the backwash of Zombie's tire smoke. Look for a link coming soon, directing EV fans on how they can buy one of their own. All proceeds from the sale of these shirts will go to support Chip's art supply chest so he can continue creating electrifying artwork.